What you can’t see: So what you can’t see is that behind me there are a hoard of tourists all trying to get that money shot. I waited patiently (well patiently for me anyway) for people to get out of my way, which took a wee while. I wasn’t adverse to having people in the shot and I have other photos of the same day where I have heaps of people but I just wanted one where there was no one around. I am definitely glad I did wait around for everyone to get out of the shot. 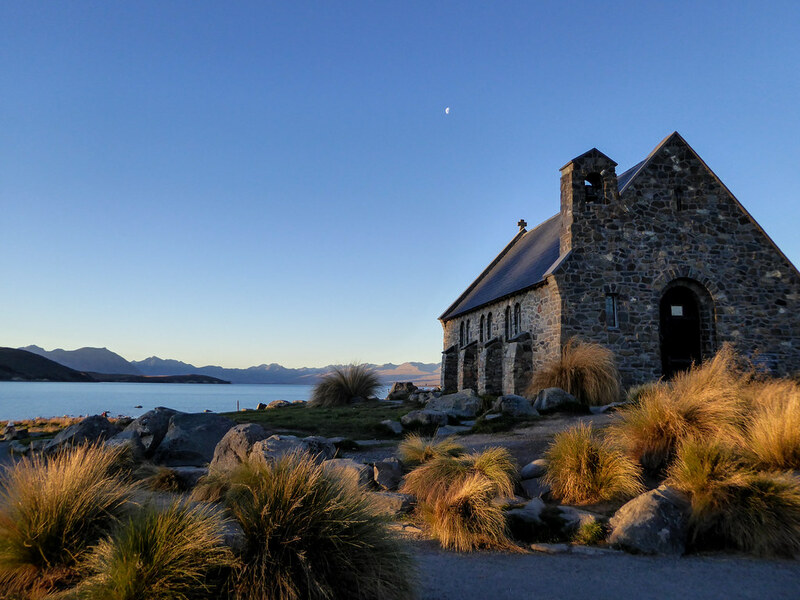 History of the Church: Set on the banks of Lake Tekapo in the stunning Mackenzie Country of New Zealand’s South Island, the Church of the Good Shepherd was built as a memorial of the pioneers of the region. The first stone was laid back in January 1935 by the then Duke of Gloucester (long way to come to lay a stone for a tiny church in the middle of nowhere!). It has been the venue for many a wedding and numerous more tourist selfies ever since. Near the tiny church is a bronze statue of a sheepdog. Commissioned by locals in 1968, it is a tribute to the dogs “without the help of which the grazing of this mountain country would be impossible”. Why should you visit: The church is a historic New Zealand site and it is stunning in every way. It is the perfect setting for all types of photography plus it would be wrong to go to this area and not come away with a photo of the Church of the Good Shepherd. Little Tip: it should be noted that whilst you can go inside the church during open hours, you are unable to take photos inside the church. Final Thoughts: When I began my road trip back in autumn 2016 (feels like so long ago now), I knew one thing for certain – I wanted to stay at least two nights at Lake Tekapo. The only other time I had been there was a drive through from Twizel to Christchurch in 2008. I remember visiting the church then and it imprinting on my brain. This is probably the photo that I a) have shared the most and b) am the most proud of. It is very nice. I like that the moon is there too. Thanks. Would have been amazing if it had been a full moon!